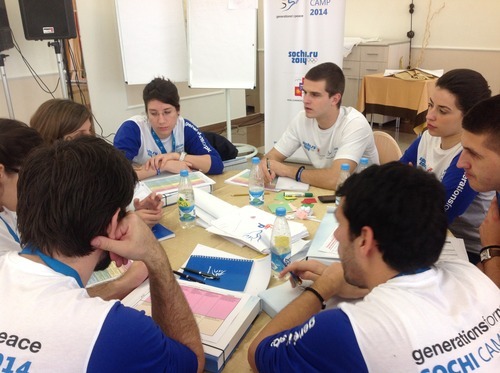 The morning of Day Seven of the 2014 Sochi Camp focused on the concept of Monitoring and Evaluation (M&E). Having already been introduced to several important monitoring concepts (to review these concepts click here), the Delegates were equipped for a more comprehensive discussion on conducting M&E. In the simplest terms, monitoring is the gathering of information to help you understand a given situation. For example, when you go for a drive, you don’t just drive straight without taking note of your surroundings. Rather, as you drive, you constantly stay aware, look around, and collect information about what is happening. This constant looking out for obstacles as you drive lets you drive carefully and avoid accidents. This process can be termed monitoring. In the driving example, evaluation is what you do after you complete your journey. If you encounter lions, tigers and bears on your journey, you are likely to reflect on the experience and ultimately change your route for the next car ride. Reflecting on a situation and asking, “why did this happen?” and “how can this be improved for next time?” is Evaluation. The Sochi Camp Delegates were taken from these basic definitions into a mock participatory evaluation so that they can carry out such evaluations at the end of their Generations For Peace Programmes. Our Serbian Delegates (the focus of today’s blog) engaged in a deep discussion about their future GFP Programme Cycle.